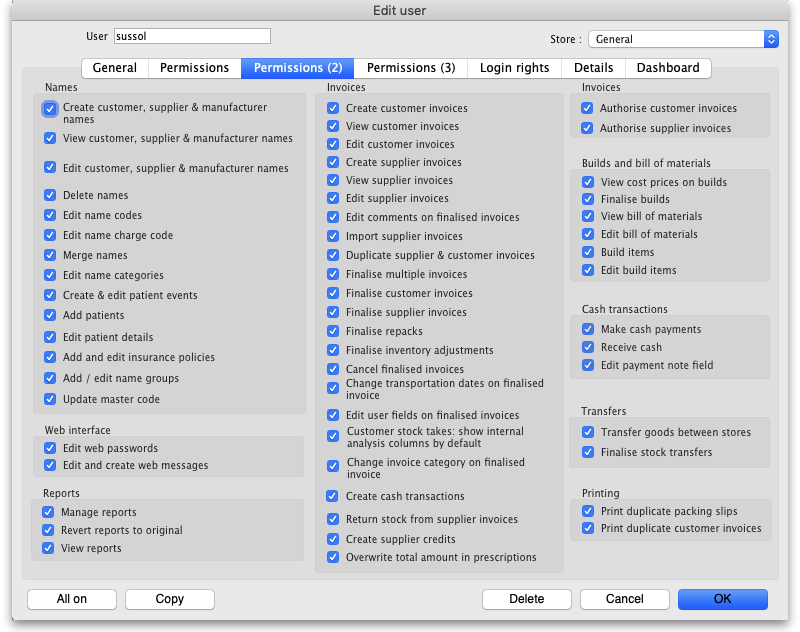 User permissions are now per-store, so a user can have different permissions when logged into different stores. You can create and use user groups. Once a group is set up and permissions for the group assigned, any users that are assigned to the group will inherit the group's permissions, rather than having to set permissions for each user individually. When you change a group's permissions, you change the permissions for all users who belong to that group. This is very useful if you have a lot of users. Edit the user, change the Is a member of to None, click OK.
Edit the user, set permissions as required, click OK. Refer to Using groups below for more details. If the user is to remain part of the group then you must change the group's permissions (see Editing a group below) but beware, this will change the permissions for all users who belong to the group, not just the user you're interested in. Edit the user, uncheck the Active checkbox, click OK.
To prevent all users being disabled in the system, mSupply does not allow the first 2 users created to be disabled, even if they belong to a group which has been disabled. mSupply has a comprehensive system of controlling user access, allowing you to manage in fine detail what each user can do and see in the system. You can manage users individually, in groups or a mixture of both - whichever is most suitable for your situation. Job title The user's job title, as entered on the details tab of the user's details form. Group The group the user belongs to. Will be blank of the user does not belong to a group. Active Checked if the user is allowed to login to the system. Active Checked if the group is active. If the group is active then all users in the group are allowed to login to the system. If the group is inactive (checkbox unchecked), all users in the group are inactive and are not allowed to login to the system. 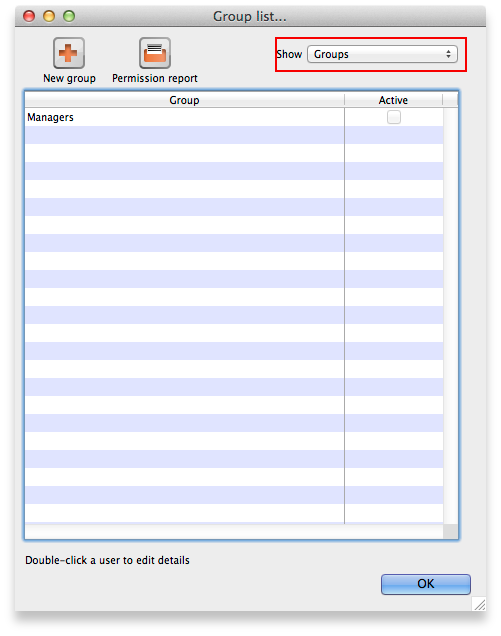 To get a list of all current user permissions, click the Permission Report button. An Excel spreadsheet will be generated (see sample); it will have one worksheet for each store showing all the users and groups and what permissions they have in that store. This window has several tabs, all described below. Is a member of drop down list: Used to select the permissions group the user belongs to (see below). When the window loads, it displays the group the user currently belongs to - will show “None” if they are not a member of any group. Password textbox: Will always appear empty when the window is loaded. Must be set for a new user, can be used to change the password of an existing user. Confirm password textbox: If something is entered in the Password textbox then the same text must be entered in here. Makes sure you set the password to what you think you're setting it to! Active checkbox: If this checkbox is checked, then that user has permission to use the system, and their name will appear in the login window. If this checkbox is unchecked the user will not be allowed to login to the system and their name will not appear in the login window. Can be responsible officer checkbox: If this box is checked, the name of that user will appear for selection in the Responsible Officer selector on the Transport Details tab of a customer invoice. User initials User initials should be entered in this field. LDAP section: used to check a user's login credentials against an LDAP (Lightweight Directory Access Protocol) server. If you are going to use LDAP you must fill in the server details in the General preferences first. 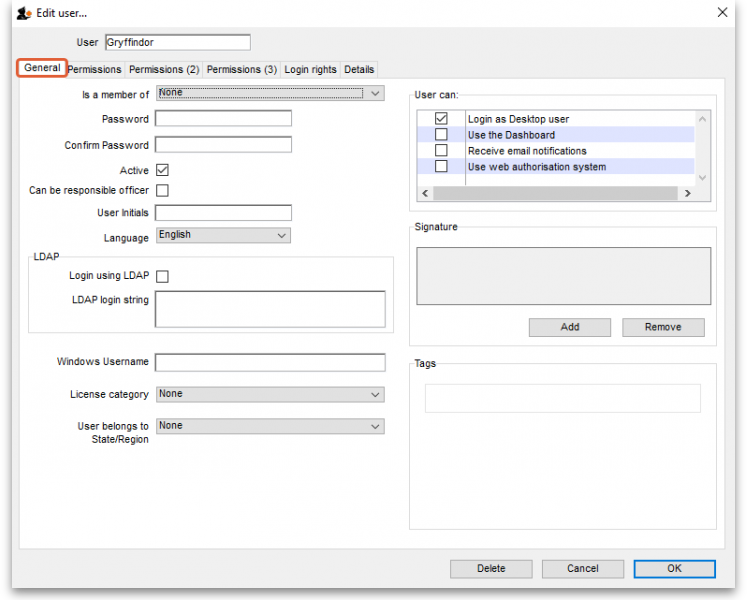 Login using LDAP: Check this if you want this user's login details to be checked against your LDAP server. Means that you can have some users logging in normally and some being checked against your LDAP server. Helpful if there's a delay in users being given LDAP credentials for any reason. LDAP login string: Enter any string which has to be used with the LDAP login. Will be provided by the LDAP administrator if required. Windows username textbox: the username the user logs into window systems with. Used to provide single-sign-on capability when the user is logging in remotely to an mSupply client running on a Windows server. License category drop down list: Used to select which user license category the user belongs to. Will contain a list of all user categories currently set up in the datafile. See License management for details. User belongs to State/Region drop down list: Used to select the name category 1 that the user belongs to. Only used in some customised versions of mSupply. These are where you can set access to the many features and functions on a store-by-store basis for each user or group. There are three Permissions tabs and each are shown in the screenshots below. 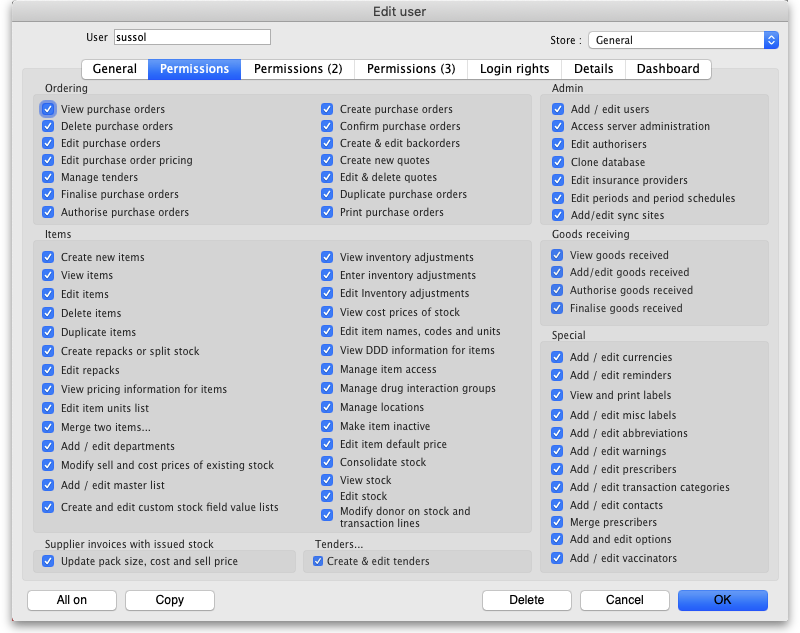 The Store drop down list: Selects the store for which permissions are being displayed and set on the current tab. This is how you set permissions in different stores for users. 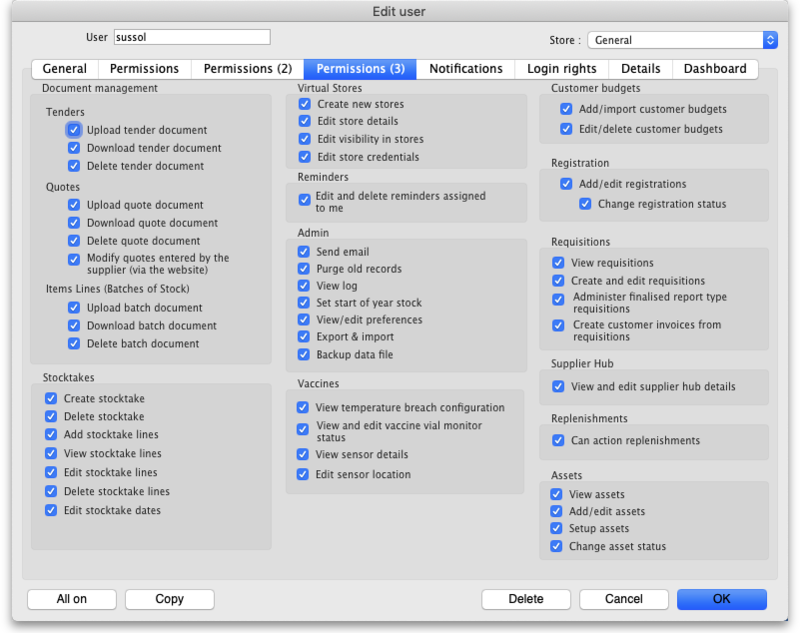 The All on button: Checks all the permissions on the current tab i.e. turns them all on. There are exceptions to this for safety reasons e.g. the Can update pack size, cost and sell price permission on the Permissions tab. The Copy button: Copies the state of all the checkboxes on the tab for this store to an internal clipboard for that tab. The Paste button: Pastes the checkbox settings saved to the clipboard for the current tab to this tab. In this way, the Copy and Paste buttons are a great way of copying permission settings for tabs between stores - really handy when users have similar permissions in different stores. Add/edit users To prevent you being locked out of your datafile permanently, mSupply will not allow you to turn off this preference for the first 2 users which already exist when you open mSupply for the first time. You should always treat these users as admin users. The Is disabled column indicates whether a store is disabled or not and can't be edited. You can check one box in the Default store column - this will be the store the user is offered by default every time they login or switch stores. The “Drug Registration” store is a special store used for the mSupply medicine registration functionality. See Registration for more details. Checking this box will allow the user to login to the Registration module. The “Hospital Info System” is another special store used for mSupply's built-in Hospital Information system. See here for more details. Checking this box will allow the user to login to the HIS module. “Supervisor - All stores” stores is a special mode to allow users to view information in and run reports over multiple stores. See here for more information. Here some personal details including job title, address and email address of the user can be recorded. The job title will appear in the Job title column in the list of users and the email address is used when using email functionality or other special functions in mSupply. Other than that, these fields are for reference only, providing a handy place to record information about your system users. On this tab you set which dashboard tabs will appear on the dashboard when the user logs into it. Of course, you have to set up the dashboard tabs before you can assign them to a user's dashboard. See Dashboard for instructions on doing that. Once the dashboard tabs have been setup, they will appear in the Available column of this tab. You can see the “Test_tab” in the screenshot above. Anything in the Chosen column will be displayed on the user's dashboard. So, to make a dashboard tab appear on the user's dashboard, select it in the Available column and click on the >> icon to move the tab into the Chosen column. And to remove a dashboard tab from the user's dashboard, simply select it in the Chosen column and click on the << icon to move it back into the Available column. Go to the Login rights tab and set the stores the user can login to. The user should now be able to log in. After the user logs in, they may want to change their password. Note that you won't be able to delete a group that has users belonging to it. If you really want to delete the group, remove all users from the group first by editing their Is a member of fields. Note that you will only be able to set checkboxes which can have different settings in different stores. Anything that is not a checkbox and that applies across all stores cannot be set in a group's permissions. These items will all be disabled when creating or editing a group. Then double click on a group in the list. The same window as for adding a group opens but it is populated with the group's current settings. Change these settings as described for a new group above and click on the OK button to save them. Click on the OK button to save you changes. A menu item on the Special menu of the navigator gives access to a form to view and edit user license categories, including the number of users belonging to them that can be logged in at any one time. A DDL on the user input form allows a user to be assigned to a category and a new permission covers the ability to edit these license categories and membership of them. Finally, a check on the OK button of the login form will check that there are less than the maximum users belonging to the license category the user belongs to already logged in.